Jarrett Indoor Plant Hire specialise in vertical gardening. Do you have limited space, a corner that looks plain and empty or a structural pillar that is an eyesore? Are you looking for something with flair? Vertical walls look sensational and can be used as a feature in your office environment. Trailing plants can grow to cover the entire vertical wall providing a screen of thick lush growth. 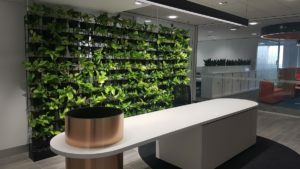 Whilst not only providing a beautiful aesthetic appearance, vertical walls also improve the indoor air quality and create a more productive work environment. Jarrett Indoor Plant Hire will ensure that your vertical wall is maintained to peak condition and always looks its best. Click here to view our green and vertical walls gallery.